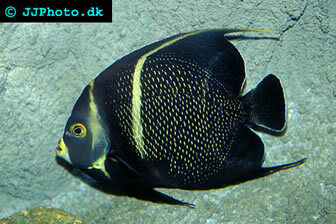 The French Angelfish (Pomacanthus paru) is commonly referred to as the French Angel in everyday speech. It is a popular aquarium fish and is also sold fresh as food fish, particularly in Singapore and Thailand. Reports of ciguatera poisoning exist. The French Angelfish (Pomacanthus paru) is easily confused with the closely related Grey Angel (Pomacanthus arcuatus). Pomacanthus paru has not been evaluated for the IUCN Red List of Threatened Species. French Angelfish is found in the Western and Eastern Atlantic. In the Western Atlantic, you can encounter it from Florida, USA, to Bahamas, and all the way down to Brazil, including the Gulf of Mexico and the Caribbean Sea. In the Eastern Atlantic, it is found in West Africa and the Cape Verde Island. 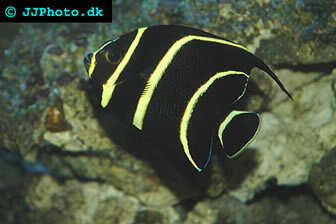 French Angelfish is common in shallow reef environments, typically in the upper 40 meters / 130 feet of the water column. They can however venture fairly deep; their known depth range is 3 -100 meters / 10-330 feet. This species is usually found on coral reefs (preferably close to sea fans) and over rocky, broken bottoms, but it can also be encountered on grassy flats. The French Angelfish is usually seen in pairs and they are believed to stay together until separated by death. Together, the couple will slowly browse through the surroundings during the day in search of food. During the night, they will seek shelter and you can expect them to go back to the same hiding spot each evening. They are highly territorial. Juvenile specimens (up to a size of 5-7 cm / 2-2.75 in) are known to set up cleaning stations where they remove parasites from many different species of fish. The largest scientifically measured French Angelfish was 41.1 cm / 16.2 in. Juveniles are dark brown to black and decorated with curved yellow bands across the head and body. As the fish becomes an adult, the yellow bands will fade except for the yellow bar located at the outer base of the pectoral fin. The scales will become black with yellow rims and most of the face will develop into a light blue shade, with the exception of the chin and mouth region which turn white. The French Angelfish is a comparatively hardy species and it will usually adapt well to a life in aquariums. It is euryhaline, i.e. it tolerates a wide range of salinity. It is however best to keep the salinity within the 1.020-1.025 range and avoid rapid changes in salinity. The pH-value should be 8.1-8.4 and the water temperature around 74-78 degrees F / 23-25.5 degrees C.
This species is ideally kept in pairs. The pair will be territorial, especially during the breeding period. You will need an aquarium of at least 100 gallons / 375 litres to house a pair. Include plenty of live rock in the set up and create a lot of suitable hiding spots. The live rock will give the fish opportunity to carry out their normal browsing behaviour. This fish is not recommended for reef aquariums, since it likes to nip at soft corals, stony corals and clam mantles. In the wild, the French Angelfish feeds on sponges, bryozoans, gorgonians, tunicates, zoantharians, corals and algae. Juveniles set up cleaning stations where they remove parasites from larger fish, but their staple food is usually algae and detritus. Provide your French Angelfish with an omnivorous diet similar to what it would eat in the wild in the aquarium. You can for instance use a high-quality angelfish preparation with added sponge matter combined with meaty foods (e.g. various shrimps), marine algae and spirulina. Feed your fish several times throughout the day instead of giving it just one or two large meals. This species will usually accept live, fresh, frozen and formula food. The French Angelfish is an egg-laying species that will scatter the eggs. The pair bond is believed to last for life and the pair becomes highly territorial during the spawning period with both sexes vigorously defending their turf against other pairs. Sexual maturity is normally reached when the fish is roughly 3.5 years old. During spawning, the female fish will swim upwards towards the surface together with her partner. She will release the eggs into the water and the male will fertilize them. The eggs are buoyant and will join the plankton of the ocean. Even after the eggs have hatched, the young will stay among the floating plankton until they have become big enough to swim down to a coral reef or similar and settle. The French Angelfish has been successfully bred in captivity.